It’s a mysterious case worthy of Sherlock Holmes – seemingly random bursts of radio emission generated from somewhere outside the Milky Way, with no obvious source. These emissions, known as Fast Radio Bursts (FRB), have plagued astronomers over the last several years. They were initially discovered in data archives of the Parkes radio telescope in Australia, popping up as relatively strong radio bursts that lasted only 5 milliseconds. The usual radio bursts we detect are usually repeating, emanating from rapidly spinning neutron stars known as pulsars. This radio signal was all alone. Even stranger, the signal was dispersed, which means the higher frequency portion of the burst was detected before the lower frequencies. Dispersion is a result of the lower frequency signal being slowed preferentially compared to the high frequencies by the electron clouds between us and the source. Measuring the delay between low and high frequency gives us the distance the signal has traveled. This dispersion indicated that the burst must have originated from very far away – by at least 1 Gigaparsec. That’s a distance of over 3 billion light years! Since the archival discovery of FRBs, these sneaky radio bursts have been caught in the act by Parkes telescope, as well as Arecibo in Puerto Rico and the Green Bank Telescope in West Virginia. But until now, there have been no detections in any other wavelengths than radio. In today’s paper, we see for the first time a possible counterpart for an FRB detected in very high energy gamma rays using the Swift telescope. Swift has onboard the Burst Alert Telescope (BAT) that is usually triggered when a gamma ray burst goes off somewhere in the universe. If a typical gamma ray burst was responsible for FRBs, then the BAT would have been triggered, providing almost instantaneous gamma ray measurements in the same general direction of the the FRB. The authors of today’s paper, however, wondered if perhaps there is a gamma ray counterpart to the FRBs, but is not luminous enough to trigger the BAT on Swift. 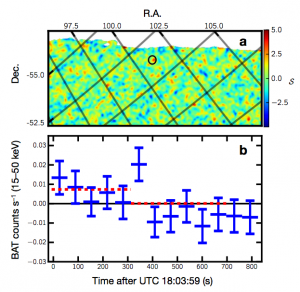 They therefore went digging in the archival BAT data, looking for times when Swift just fortuitously happened to be looking in the same direction as an FRB when the radio signal was detected. Figure 1 The Swift BAT detection of FRB 131104. (a) shows the portion of the field of view of the BAT where the gamma ray counterpart was detected, denoted by the black circle near the top of the image. The x- and y-axes denote the position on the sky in right ascension (RA) and declination (dec), and the color bar shows how well-detected the emission is, in units of signal above the noise. (b) gives the number of photons detected per second as a function of time for gamma rays in the 5-15 keV energy range. Sure enough, there were four times when an FRB was detected within the same field of view as the BAT on Swift. Of these four possibilities, a gamma ray counterpart was detected for the FRB 131104 (so named for two digits for the year, month, and date of observation.) This detection is shown in Figure 1. This FRB is located 3.2 Gigaparsecs away, which corresponds to a redshift of z ~ 0.55. The reason that the BAT was not triggered for this gamma ray burst was because it was on the very edge of the detector, illuminating only 2.9% of the telescope’s detector. The authors were very careful to rule out other causes for the gamma rays. Of course, there are still unanswered questions about this detection. One mystery is that while the FRB lasted only 5 milliseconds, the emission detected in gamma rays lasted several minutes and released significantly more energy — a billion times more — than was detected in the radio burst. One theory posits that the sources of FRBs are brightly flaring magnetars, which are neutron stars with extremely high magnetic fields. However, if magnetars are the culprit, then the gamma ray emission should not be nearly that long nor that energetic. On the other hand, FRBs with gamma ray counterparts could be caused by binary neutron stars spiraling into each other. However, models indicate that we should see only about 25 of these events a year, whereas the inferred rate of FRBs is thought to be on the order of thousands per day. Suffice it to say, I think this is a mystery that would stump even the great detective Holmes himself (minus the small detail that he wasn’t an astrophysicist.) In some ways, this new gamma ray counterpart discovery is extremely enlightening, giving clues as to where to look next for the source of FRBs. On the other hand, however, this detection has resulted in even more questions about FRB origins. As is often the case in science, more data are needed! In the future, we should be able to fine tune the threshold for triggering the BAT when the next fast radio burst goes off, allowing us to catch it the FRB and its gamma rays in the act.